Play Tiny Toon Adventures: Buster's Hidden Treasure Now! Hit it big when you join Buster Bunny on a 33 stage hunt for treasure. So loaded with hare raising animation, it's like playing in a wacked out Tiny Toon cartoon! Do you dare to set paw on this mysterious island? Trip through seven tangly territories that include an overly enchanted forest, caverns of bubbling lava-lava, secret underground seas, plains that are just plain crazy, a freaky factory, a mega mountain and a spooky shipwreck rumored to be dripping in 14 carrot gold! Save Babs Bunny and the rest of your pals along the way and you'll really see some kooky island hopping. With Gogo Dodo as your guide, you can be sure this adventure is packed with tricks, traps and hidden bonus areas. But be very sure to watch out for the fortune-hungry folks who will try to throw you off the trail - Elmyra, Plucky Duck, Hamton, Dizzy Devil, Calamity Coyote, Montana Max and his Robot. (Whew!) No one said fame and fortune was easy! Based off of the hit cartoon show, aired on FOX and Nickelodeon in the early 90's, Tiny Toon Adventures: Buster's Hidden Treasure certainly lays down a big world of fun! The gameplay is similar to that of Sonic The Hedgehog in some ways; it has a great feel of speed, and it is easy to play. 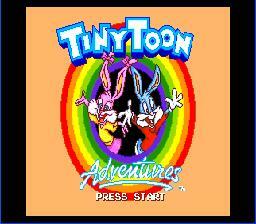 The sounds work very well with the comedic image of the game, and the Tiny Toon Adventure theme is used well. The graphics compliment it even more, everything very detailed and looking like their TV counterparts. Final verdict, I say if you're a fan of the old cartoon show and even if you're not, you have to give this one a play. As mentioned in the overview, Tiny Toon Adventures: Buster's Hidden Treasure plays very much like Sonic The Hedgehog in a few aspects. To begin, as Buster Bunny moves, he slowly speeds up and his legs move in quick circles in typical cartoon fashion. Another similarity is the way you defeat enemies. You only have to avoid attacks coming at you and jump on the heads of the baddies, knocking them for a loop. There are also some features new to gamers, such as the ability to bounce wall to wall when they close in. To perform a wall bounce, jump up to a wall and then once more against it. Jumping again will perform the wall bounce which will come in handy at some points. The typical "currency" of this game is carrots, which works in quite a big way. When you collect 50 carrots in one stage, this gives you what is called a helper. Either in the form of Lil' Beeper, Sneezer or Concord Condor, the helper can be called on to appear and take out all of the on screen enemies. Keep one close, because you never know when you'll find yourself in a bind. You begin with a life span of three hearts. To enhance your heart meter with more, you can find gold bells. Finding diamonds will make you invincible for a short period of time. At the end of every few levels, you'll be met with certain boss fights that take the form of Tiny Toon characters such as Dizzy Devil and Montana Max. There are certain ways to fight through these and it's up to you to figure out the patterns so you can defeat them and move on.